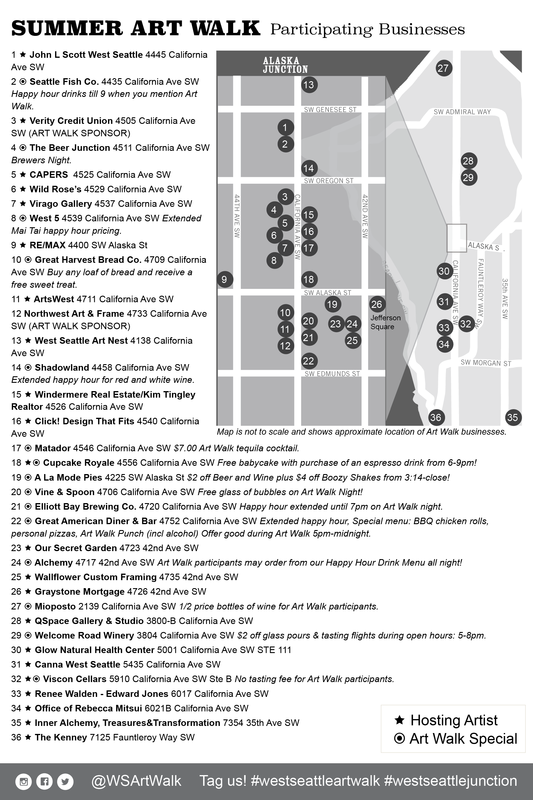 Welcome to the August edition of the West Seattle Art Walk! Thursday, August 9th 5pm to late (hours vary by location; see below). Our participating artists, businesses, and restaurants are excited to welcome the community to stop by and join in celebrating our vibrant art scene. See the listing below for all businesses hosting art in August. For restaurant specials, click here. Congratulations to Lorrie Brogan, whose painting is featured in our Q3 print materials. She will have a solo show at Windermere in September. Pick up a hard copy of our printed postcards at any of our participating Art Walk businesses or click here to view the Google map. Ellen Zrimsek has been creating encaustic/mixed media art pieces for the past 6 years. Her works focus primarily on natural subjects inspired by travels and explorations into wild places. She finds the encaustic process both simple and complex, fascinating and limitless. She loves working with wax and heat as it allows Mystery to co-create the finished product. Ritual Objects is the third in a experimental triptych of 2018 exhibits pivoting around the idea of the Black Imagination– a delicate realm protected and sustained only by the powerful dynamism of black-identified individuals around the world. Previous iterations, The States of Matter (January 2018) and The (g)LISTENING (April 2018) used technology and storytelling to create a publicly accessible dialogues around black joy, wellness, and creativity for a live gallery experience accessible by appointment only. This project came to fruition because of the generous support of Black Imagination co-curators, Amber Flame, Rachael Ferguson, and Imani Sims, and because of the generous audio and text contributions from over 100 black-identified people from all over Washington state and the world– from as far away as Morocco, Belize, New Zealand, and Taiwan. This project unapologetically centers and focuses on Black Humanity, celebrates our multitudinous spiritual and cultural territories, and also takes into account how income inequality is historically predicated. 4Culture, Seattle’s Office of Arts & Culture, Seattle People of Color Salon, and from generous contributions from individuals also made this work possible. Natasha Marin is a conceptual artist whose people-centered projects have circled the globe since 2012 and have been recognized and acknowledged by Art Forum, the New York Times, the Washington Post, the LA Times, NBC, Al Jazeera, Vice, PBS and others. This year, the City of Seattle and King County have backed BLACK IMAGINATION– a series of conceptual exhibitions. Black Imagination has engaged (and paid!) black folks from all over the PNW region and the world– amplifying, centering, and holding sacred a diverse sample of voices including LGBTQIA+ black youth, incarcerated black women, black folks with disabilities, unsheltered black folks, and black children. The viral web-based project, Reparations, engaged a quarter of a million people worldwide in the practice of “leveraging privilege,” and earned Marin, a mother of two, death threats by the dozens. As a busy consultant and community builder, Natasha was listed as one of 30 women who “Run This City” by Seattle Met magazine in 2018. ARTIST STATEMENT: Drawing from my love of figurative painting and of animals and the natural world, my most recent work focuses on specific animals that are endangered, accompanied by the next generation of humans. As we humans continue to expand our presence on the planet, we are displacing, endangering, and threatening other species with extinction. They are endangered due to habitat loss, trophy hunting, palm oil deforestation, climate change – the planet we will hand to future generations could be vastly different from the one we now know, devoid of many of the animals that currently make up the Endangered Species List. Most of these works I would categorize as ‘activist art’. Some I have chosen to gild with gold or silver leaf, which adds dimension and a dynamic shifting of light and shadow. Other figurative pieces are inspired by my many years working as a professional actor in the theatre – these are characters from plays and actors in the process of working. And several are of, or based upon, women I admire. As both painter and actor, I’m drawn to female characters who are warriors, leaders, rebels, misfits, and eccentrics, some of whom are represented here. With all of my paintings, I strive to capture spirit- whether animal or human – inner life, emotion, the soul of the being that I’m painting. This, to me, is perhaps the most important thing of all. *Note there is no reception for the artist, however, the gallery will be open to Art Walk visitors. Meet artist, Tara Nelson, as she shares her watercolor doodles in “A Series Called Lebanon”. This series will have 8 NEW recreated watercolor doodles. Following Teacher Aimee, through the art and eyes of Tara, while Aimee teaches English to Syrian refugee children living in Lebanon. Hear stories, and learn how you can help. 100% of the proceeds goes to those very children. A resident of West Seattle since the time there wasn’t a high bridge (! ), I am a video designer, animator, and Illustrator. As an artist, I am a realist, with the double meaning that my work is detailed, and sharing my art makes me anxious and sweaty. This is the third time in the past two years I have participated in the Art Walk (thank you, Kim Tingley and Windermere). This year’s themes tends toward more illustrative pieces with suggested narrative or message. Some a bit “fantastic” but easily digested. Kids, animals, and Chuck Taylors. What’s not to like? Andrew Saeger and Veronica Velasco became friends while working at the Seattle Post-Intelligencer. Their shared sense of humor, passion for screen printing and design – along with a t-shirt obsession – led them to form Factory 43 with the mission of creating quality graphic goods featuring their original illustrations. Tom Costantini is an interior designer who has been drawing and sketching his whole life. He began painting with watercolors in 2017, and uses them to illustrate favorite subjects including vintage cars and trucks, landscapes and local historic buildings and boats. He is also active with the Seattle Urban Sketchers group. Tom has lived in Seattle for 30 years, and now resides in West Seattle. When not painting he can be found working on his 1940s home and in the garden, and walking along the beach at Alki. Born and raised in New York, Bryan Garcia is a multimedia artist exploring the Pacific North West and its roots. He has a fascination with nature and people. Much of his collage work explores shapes and colors combined with landscapes and portraits. He is proud to explore his own roots as a queer latinx artist encouraging his subjects to own and tell their own stories. He’ll have some prints available and Alonzo of Our Secret Garden will have the limoncello and cupcakes ready. A bonus treat: 15% off your order on Art Walk Night when you say “I want my discount”. Anita West and D.Lisa West are Seattle natives. The oldest daughters of an immigrant from Finland, they grew up in the south end of Seattle in a family compound with aunt, uncle and cousins in one house, grandparents in another and their home overlooking the backyard bowling alley. There was also a sauna and a chicken coop and a large garden. The memory series includes oil paintings and collages digging deep for the meaning of what memory is. For example, Who caught that King Salmon?, and Why is their other sister hanging her head in shame? Bowling, the ocean and high school and are key themes in their work. Artist Eli Berman will also be showing his abstract watercolors. Eli is 8 1/2 and loves art. His work is currently on display at Glow at the Junction. We look forward to seeing some friendly faces and kids are welcome. Stop by and see the new space, meet the practitioners and have a snack or a glass of wine. Remember, tasting fees are waived for Art Walk visitors on Art Walk night. S.R. Lane was born and raised in the greater Seattle area. She graduated from WWU with her degree in Performing Arts. Since then she has traveled the globe capturing photos and honing her love of art. Her art was last seen at the Art Walk Edmonds. 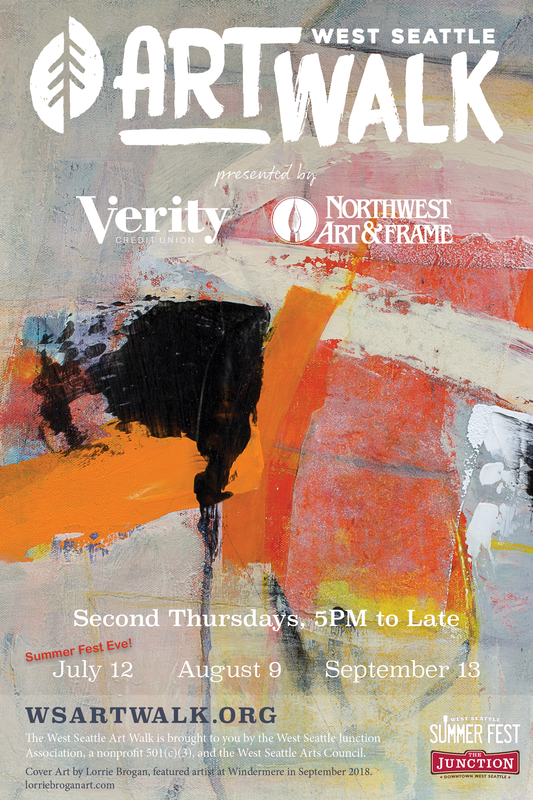 She will also be showing her work at the Phinney Community Center this August. The first FIVE people in the door will receive a free original work on paper. Inner Alchemy’s Theme for the month of August is SACRED ANIMALS. We will be featuring four local artists who have created or captured the essence of sacred animals in photographs, paintings, sculpture and collage. All artists will be on site sharing their connections to the animals in their art work. Crystal Intuitive Azura Cottier will be with us again, offering one on one consultations for the highest vibrational crystal for you and your life now. **Our Artist Collective will be meeting from 5-6pm. Come to our meet and greet and join us in creating a collective that serves and supports artists and our community! The Kenney will provide free drinks and appetizers. Come join us. Sueellen Ross, known as “America’s Definitive Cat Artist,” has devoted her career to depicting cats, dogs and wildlife in paintings and etchings. Ms. Ross combines her passion for producing art with her love for animals, to create works of exceptionally strong design and subtle wit. Her portraits, which are rendered with exquisite richness and detail, can be found in corporate, museum and private collections. Linda Israel is renowned for her vivid and compelling portrayals of animals. Her depictions of llamas, bears, moose, fox and owls are collected internationally and featured in galleries and upscale boutiques in Colorado, New Mexico, Utah and Wyoming. Ms. Israel is also the co-founder of the Olympic Wildlife Rescue Center in Olympia, WA. This post will be updated as we receive more artist details. Check back again. Also be sure to follow us on Instagram and Facebook as those pages get updated more frequently.